Note: Please contact an asbestos abatement contractor if you suspect any waste may contain asbestos. Asbestos needs to be properly packaged and identified prior to disposal. Haulers are required to call one day prior to schedule an asbestos disposal appointment. All haulers must obtain a landfill permit from the municipality which they are hauling asbestos. If hauling asbestos from more than one municipality; the hauler must obtain a landfill permit from each municipality. In order to dispose asbestos, haulers must have an asbestos manifest. Haulers can call the landfill office or go to our website www.mcswma.com to obtain a manifest. When a hauler arrives at the landfill; park the vehicle on the scale and enter the office to be weighed. Scale attendant will weigh the truck; provide the hauler an asbestos form, directions, and any other required instructions. The scale attendant will inform landfill staff that an asbestos load has arrived. The hauler will proceed to the designated landfill area for disposal. The haulers asbestos load will get measured and informed where to dispose the asbestos. After disposal, the hauler will return to the scale, park vehicle, and enter the office to weigh out and sign ticket. If the hauler is delivering asbestos from more than one municipality; the hauler will be assessed the per load charge (i.e. $200, $400, etc.) for each municipality from which it is hauled. Combining loads of asbestos from multiple entities is discouraged. If loads are combined from multiple entities, it is the haulers responsibility to ensure proper documentation is presented for each individual load. Haulers should expect delays at the scale office, if they choose to combine asbestos loads from multiple entities. 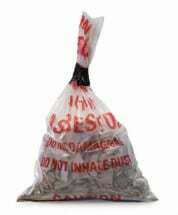 Friable and non-friable asbestos must be wetted, double bagged in six-mil poly bags and labeled. Both the inner and outer bags must be evacuated of all air. It is very difficult to bury asbestos-containing “balloons”, which burst as they are covered. Loads will be inspected at the facility. Every bag will be labeled. In addition to properly handling asbestos-containing materials per DEQ, EPA, and solid waste guidelines, all asbestos accepted at the Marquette County Landfill must have each container individually labeled with the name of the waste generator and the location it came from, per MDEQ regulations. Loads of roofing and other large bulky items like pipe and siding shall be wetted and wrapped or, at a minimum, be placed in a lined sealed container. Any load that is not properly contained will be rejected. Non-friable materials will be handled and wetted such that no airborne particles are produced. Under no circumstance will any asbestos be placed anywhere in the landfill other than in the asbestos disposal area. Improper disposal of asbestos will result in severe penalties. For information concerning handling and acceptance of asbestos, call 249-4125.